chess player would consider playing an obviously lost game. The introduction of the doubling block (variously called the cube or the doubler) is a relatively recent innovation and has added an extraordinary new dimension to the skill of backgammon. The importance of astute use of the doubler is, in fact, difficult to exaggerate. Should an expert player from Armenia, for example, where they do not use the doubler, compete against an average player who is expert in its use (if there is such a phenomenon), the latter would win. The doubler is the key to backgammon. The doubling block is a large die with numbers ranging from 2 to 4 to 8 to 16 to 32 to 64. At the beginning of any game, this die rests at the side of the board and is brought into play by whichever player thinks he has the first advantage. Either player may double or redouble only when it is his turn to roll, and only before he rolls. For example, if one player believes he is ahead at any moment in a game being played at 10¢/$1/$10 or whatever a point, he may double his opponent to 2. (Without the doubler, one point is scored for winning a single game.) Either player may make the first double, but having done so, he may not double again until redoubled by his opponent. 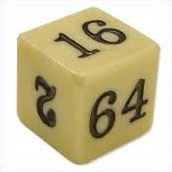 Further, occasionally at the beginning of a game, both players, rolling one die, may roll the same number. By prior arrangement, the doubler may then begin at 2. These are called automatic doubles, but they play no part in the strategy of backgammon, nor are they ever used in tournaments. They are only employed in certain money games as a means of increasing the stakes. A volume could be written on the doubler alone. Assume, as so often happens, that someone shows you a certain backgammon position and then asks: “Should black double and should white accept?” Given this scant information, the question is meaningless. In order to answer the question accurately, one must also know who is playing whom. Is it a tournament match, and if so, what is the score? What are the relative skills of the opponents? Is it a money game? Is black redoubling or is this the first double? How high are the stakes? Is it a chouette, and if so, how many players are involved? These are just a few of the factors that must be clarified in order to answer the question. The longer one considers the doubler, the more complex it seems to become. Does your opponent tend to take doubles? If so, wait until his position is nearly hopeless. Is he prone to dropping early? Then offer him a double against the odds in the hope that he will. Here, as in other areas of backgammon, adapting your game to your adversary’s is vital. The taking of a double against player A would be a certain drop against player B. You should double player C early and be more cautious against player D.
More often than not, the unobservant player merely examines the position on the board. For instance, if white doubles black in the situation in Diagram 64, black with a block on white’s 5 point, and white with several men still to transport into his inner board, black should accept if white is the stronger player, whereas he should drop if black is an expert pitted against a weaker player, since there is little expertise left in this game. The doubler is a razor-sharp boomerang and it could be suicidal to allow it to fall into the wrong hands. Therefore, the giving of a double depends not only on the position of the moment but on the psychological make-up and technical ability of your adversary. To comprehend the theory inherent in the doubler is probably the most important part of backgammon. The thrifty use of this instrument can launch an ordinary player into the higher echelons of the game. Beginners are invariably taught not to take “bad doubles.” Of course the advice is sound and sensible, but there is a corollary which is even more sensible: Do not drop when you should take. Unquestionably, the greatest number of points lost in backgammon is by players refusing doubles they should have taken. One should not take bad doubles, but a more positive philosophy is: When in doubt, take. Consider the fact that if you take four doubles and lose three of them, you are still even — presupposing, of course, that no gammons are involved. This phenomenon will be examined later in the chapter; for the moment, accustom yourself to accepting playable doubles. Few players understand the leverage they acquire by taking a double. By doing so and by not redoubling until the right moment, you are in the game to the end. Even if the roof falls in, you can still take advantage of every miracle roll to extricate yourself. Generally speaking, then, when do you take a double? If you are less than a 3 to 1 underdog and there is no danger of losing a double game, you should take a double every time in money games. It may seem odd to allow the stakes to be doubled when you are an underdog, but consider the logic of the matter. Assume the stake is $1 a point and you are doubled by your opponent. If you drop, you lose $1. If you take the double, you risk losing one additional dollar — that is, $2. On the other hand, if you win the game, you win $2. Thus, your net position, instead of being −1 (if you had refused the double) is now +2, a difference of 3. So by taking a double and winning, you are $3 better off than you would have been if you had dropped. You have won $3 while only risking one additional dollar. Therefore, any time you are less than a 3 to 1 underdog, you should accept a double. In Diagram 65, white has two men on his 2 point and black has two men on his 1 point. All their other men have been borne off. At this point, white doubles. Should black accept? In money games, the answer is yes, yet time after time people drop in this position. Sometimes a player will say, “I’d take if I were being doubled from 2 to 4, but not when it’s from 32 to 64.” This kind of specious reasoning is cowardly and exasperating. If it is a take from 2 to 4, it is just as much a take from 32 to 64. How many combinations does white require to bear off both men on this roll? The answer is 26. All 1’s except double 1’s prevent him from coming off — a total of 10 unfavorable combinations. Thus. the odds are 26 to 10, or 13 to 5, in favor of white. The fraction 13 to 5 is less than 3 to 1, and since black is getting 3 to 1 for his additional dollar, he should accept. This is a basic rule of thumb for accepting doubles. On the other hand, white is perfectly correct in doubling, since he is a 13 to 5 favorite to win. Here is an example where one player doubles, his opponent takes, and both are correct. Obviously, to want to double the stakes, you have to be ahead, but it is a matter of opinion just how far you should be ahead. In our opinion, if it is possible to compute, you should be at least a 3 to 2 favorite when you offer the first double, but you should be a minimum favorite of 2 to 1 to redouble. The reason for this discrepancy is that before the first double is offered, the cube is in the public domain; that is, either player has access to it and may employ it. But once you have been doubled, the cube becomes your property and can never be taken away from you. It is the most potent weapon in your arsenal and you should be wary of releasing it. You should wait, in fact, until you are fairly certain that your adversary will capitulate. There are occasions when your position becomes overwhelmingly powerful within a few moves and the opportunity for a gammon arises. In this case, do not double — unless your opponent has a point in your inner board, in which case you should double him out. In other words, avoid playing for a gammon (usually in tournaments and almost always in money games) if your opponent has a block on your 1 point and a potential board — that is, when he has no men out of play. This holds true regardless of how many of his men you have on the bar. You are in jeopardy until the game is over, not to mention the jolting psychological blow of losing a hard-fought game at the eleventh hour. The enemy is too apt to get one or more shots before the game ends. Here the risk rarely justifies the rewards. One of the persistent curiosities of the doubler is that if you refuse a double in three consecutive games and are right twice and wrong once, you are losing money. This is proved again and again in chouettes, where one player is pitted against two or more players, and where it is often possible to witness the outcome of a game after you have dropped. Consider (assuming, of course, no gammons): if you drop three times, you are −3. If you had taken all three doubles, you would be −2, −2 and +2, for a net of −2, or 1 point better off than those who dropped all three games. But it is difficult to convince someone who has just been right two out of three times that he is wrong. Wrong he is, however, and the sooner he understands it, the wealthier — or less poor — he will be. If you have accepted a double, and, later on in the game get a direct shot (25 to ll against) which, if you hit, will win the game for you, the acceptance of the double has been vindicated. (Again, this presupposes no gammons.) In the long run, your take will have been justified even if in this specific instance you do not hit the blot. This is just another way of saying that you were less than a 3 to 1 underdog, since 25 to 11 is approximately 2¼ to 1. Let us assume that you have borne off several of your men, but in doing so leave a triple shot. If your opponent misses, he is in great danger of losing a double game, but he doubles anyway. Most players look at the triple shot as though they had seen a ghost; they blanch and drop. But they should take. The odds are 3 to 1 in your opponent’s favor, which you will remember is the dividing line for taking doubles; therefore the take per se is even money. But you have an excellent chance for a double game if your opponent misses, and so what you stand to gain by taking makes it, in effect, a winning proposition financially. Regarding “late” doubles: A moot position often arises in a chouette when some members of the partnership wish to double the box and others do not. Assume the final decision to be not to double. The captain then rolls a perfect roll, destroying his opponent’s position. Those who had advocated doubling now complain that it was wrong not to have doubled before, when the box would have accepted. On the next roll the captain doubles, the box drops, and recriminitions multiply. Two important factors are generally overlooked in these situations. The captain could not have known that he was about to roll the perfect shot; in fact, the odds were against it. More importantly, by waiting one roll, the partners now have the money in their pockets, whereas if they had doubled earlier and it had been accepted, the box would still be in the game with a chance to win. Any time you can force your opponent to drop, you have accomplished a great deal. More than anything else, the dice are to be respected, for they have all the power. By doubling and making your opponent surrender, instead of merely raising the stakes, you show your respect for the dice and sever their hold on the outcome of the game. If the doubler is on your side and you roll a shot which turns the game around so that you will be able to redouble on the next roll, you must be sure to take no impetuous risks with any part of that roll. Do not give your opponent an opportunity to roll the perfect retaliatory shot. In Diagram 66, white has a 5-1 to play. Given the fact that the doubler is on white’s side, the correct play here is to move from black’s 3 point to his 8 point, hitting his blot, and to move the man from white’s bar point to his 6 point. This play thwarts the potential miracle rolls of 1-6 and 5-2 by black. For regardless of whether or not black comes in, white is ready to redouble on almost all return rolls by black, and does not need to take any risks. To save the 1 is not cowardly; it is using the doubler to win the game. You would make this play if the doubler was in the middle or on your side. On the other hand, if the doubler is in black’s corner, white should make his best tactical play — that is, to hit black’s blot and to use the 1 to make his bar point, thereby giving black only a 5-3 to hit. Because white cannot use the doubler to knock black from the game, the duel will be won or lost on the field; hence, white must make his best tactical maneuver. Here again it can be seen how the doubler influences the action, circumscribes one’s choices and dictates the way in which the men are moved. In Diagram 67, black has been doubled and owns the cube. The game develops into a race, and both players reach a position where they have five men off and the other ten distributed more or less equally on their 1, 2 and 3 points. But it is black’s roll. Does black redouble? Not yet. It is true that black is ahead in a race, and if no doubles are thrown, he will win. But if black releases the doubler now and white rolls a double and black does not, white can redouble and black will have to drop. A sound rule to follow about redoubling when bearing off: If both players have five rolls left (that is, ten men positioned on the lower points), wait. You may consider redoubling with four rolls left, depending on your opponent, and you must always redouble with three. If both players are left with six men — which is three more rolls — and you redouble now, your opponent has no equity in owning the cube. Let us say you roll and take two men off. Now he rolls a double, taking four men off. You still have a chance to roll a double and win, and since it is not his turn, he cannot double you out of the game beforehand. Thus, when each combatant has six men remaining on the lower points, the redouble is mandatory. If neither side has doubled and the cube is in the middle, you may offer a double much earlier, since you are giving up no equity. If you can calculate that there are seven rolls apiece remaining, offer the first double immediately. The redouble, however, is another proposition; in that case you are trying to double your opponent out of the game, not to double the stakes. In advocating “takes” as a general winning philosophy, we should issue one warning. Beware of the completely emotional take to which many players are vulnerable. In chouettes, for example, over the years we have seen dozens of players join the game late. The box will offer an early double and the new player will examine the position, then drop, though he is no more than a 7 to 5 underdog in the game. The chouette continues and the new player hits a bad streak and falls behind. At this point he gets into the box, becomes involved in a hopeless position and is open to losing a double game. He is now offered a double by his opponents and accepts. This kind of neurotic take is suicidal, deserves to be punished, and usually is. When deciding whether or not to take a double, remember to analyze each position, each acceptance or refusal, on its merits alone. Ignore the score in a money game and try to estimate whether or not you are at 3 to 1 underdog or less, with no double-game dangers. If this is the case, accept the double; if it is not, regardless of how you feel or how lucky you believe your opponent to have been, drop and get on with the next game. To sum up: When in doubt, take; when in doubt, do not double. In backgammon, it is better to be a taker than a giver. 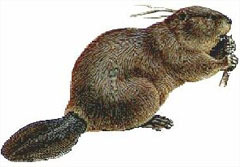 Though not included in the official laws of backgammon, there is another wrinkle to the use of the doubler, in which one contestant may beaver his opponent — provided both parties have agreed beforehand to allow beavers. In this further refinement the player who has been doubled not only has the right to accept, but immediately, before his opponent rolls, may redouble and retain the cube. Thus, if player A doubles player B to 2, B can accept and redouble to 4 before A rolls, yet still retain the right to redouble to 8 whenever he wishes. This addition is colorful and escalates the gambling ingredient, but in an expert game you will hardly ever see a beaver being offered. By itself the single take will be enough, because the expert knows what he’s doing and will not offer a rash double.